While studying for her medical degree in at the University of Mumbai (then University of Bombay) in the late 1980s, Ruxana T. Sadikot, MD, MRCP, visited the tuberculosis ward with her classmates and was astounded by how the disease could ravage a patient’s respiratory system. “People with advanced TB can almost have destroyed lungs—the physical signs can be so profound,” Dr. Sadikot says. As they made the rounds in the TB ward, Dr. Sadikot and her peers would make rough sketches of what the damage might look like inside the lungs, and then hold them up to the actual X-rays. This initial fascination would inspire a career dedicated to investigating infectious diseases. Today, Dr. Sadikot is chief of the Section of Pulmonary and Critical Care Medicine at Malcom Randall VA Medical Center, North Florida/South Georgia Veterans Health System, associate professor of medicine at the University of Florida, which she transitioned to less than a year ago from her previous position as associate program director of the Division of Pulmonary, Critical Care and Sleep Medicine at the University of Illinois at Chicago. She primarily cares for patients who inform her research in four areas: acute lung injury and sepsis, bronchiectasis and infections, nosocomial pneumonia and host defense, and prostaglandins in innate immunity. She’s become an authority, having published 70 papers in respected journals, including the American Journal of Respiratory and Critical Care Medicine, presented 60 abstracts at national and international meetings, and contributed to several textbooks and non-peer reviewed publications. The Department of Veterans Affairs has directed funding toward Dr. Sadikot’s research, and she’s received regular support from the VA for her investigations into signaling pathways in pulmonary host defense and, combined with an award from the Gatorade Foundation at the University of Florida, her current examination of TREM-1, a protein that triggers an immune response in the lung. But Dr. Sadikot is surely no stranger to extreme challenges, having earned the notoriously labor-intensive Membership of the Royal College of Physicians, or MRCP, in London while studying pleural disease under Dr. Anthony Arnold. 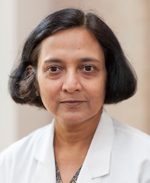 From there, she completed a registrar in respiratory medicine at the Yorkshire Health Trust in Leeds, a residency at the University of Arkansas, and a fellowship in pulmonary and critical care at Vanderbilt University, where she also worked on pleural diseases with Dr. Richard W. Light, MD, (a 2009 recipient of the ATS Distinguished Achievement Award). As an award-winning educator, she has made it her mission to impart her enthusiasm for the field of pulmonary medicine and research onto her residents, fellows, and mentees who have included Humam Farah, MD, of the Hannibal Clinic and Hannibal Regional Medical Center.